12 weeks on from Europe’s Ryder Cup triumph, the Dane has had the result inked on to his bottom. 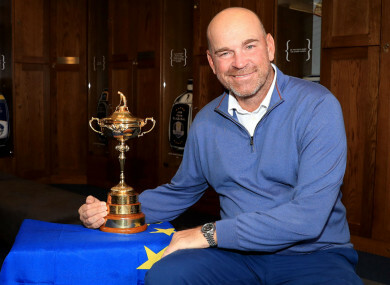 European Ryder Cup captain Thomas Bjorn. THOMAS BJORN HAS kept his promise to Europe’s victorious Ryder Cup team by having the score of this year’s event tattooed on his backside. In a jubilant news conference following the hosts’ emphatic 17.5-10.5 victory over the United States at Le Golf National in September, Europe’s players revealed Bjorn had pledged to have a tattoo in a private place if the team regained the trophy. On Christmas Eve, the official Twitter account of Europe’s Ryder Cup team shared a video to show the Dane had kept to his word. In the video, Bjorn can be seen visiting a tattoo parlour and having the score tattooed on his bottom together with an image of the Ryder Cup trophy. “Told you I would do it,” says Bjorn with a rueful smile at the end of the clip, before uttering “Merry Christmas” and dropping his head to his hands. Email “'Told you I would do it' - Cheeky Bjorn has Ryder Cup score tattooed on backside”. Feedback on “'Told you I would do it' - Cheeky Bjorn has Ryder Cup score tattooed on backside”.